Crazy fun premise, good art, but painful dialogue. So today I have before me “RoboCatz vs Thunder Dogs”. With a name like that- how the hell could I possibly turn it down? I mean it’s got explosion and a robot battle cat fighting a dog with guns on it’s shoulders. No way I’m missing this party. Let’s talk art. So overall it’s competently done. It properly uses dynamic posing, has an understanding of how to draw a form in perspective (maintains proportions), has good framing and image composition, and the color pallet is professionally done. I really like some of the posing on the comic and angles the artist chose- it shows a real dedication to this comic and a love for it. I really dug the art. The style is rather cartoony and it fits with the kind of “out there” premise of this comic. I’ll note here that my promotional copy has a little bit of artifacting from compression but even if they have it in the final it’s not bad. Like I’ve said in previous reviews- if it’s unobtrusive and has no issues then it’s really good lettering. There is an instance on page 9 where there is a dialogue balloon almost entirely covered by another one. And, like you might have guessed, the lettering is on point. I also didn’t notice any major issues with layout either but no great risks were taken. I do like the inclusion of a particularly detailed map at one point as well. The main premise is that dogs and cats have been fighting since the dawn of time and are fated to do so. What starts out as “oh ha-ha, a cat and dog fighting each other- look they even indicated saber tooth tigers and wolves fought” quickly turns into battle dogs with shells and cats with conical hats and spears fighting each other. I was about to write a line about “I don’t think there was much overlap between dire tigers and…” but then I realized that this is a total party comic where they kind of throw logic out the window in favor of bulldogs with giant spiny shells fighting cat warriors. Yep- it’s THAT kind of comic and I love it. Eventually this conflict results in cat vs dog mecha gladiator tournaments and it’s as awesome as that sounds. So while the premise is totally bonkers I have a feeling that it’s geared for, perhaps, a younger audience than me. I could be wrong because I was taken in too. Let’s talk dialogue however. it is downright PAINFUL to read. he humor, or attempt at it, is rather juvenile and relies mostly on cat and dog puns. I can’t say I wasn’t expecting that, but it’s not really all that engaging. I’ve always had issues with comedy comics- they really fall flat far too often and this one doesn’t break the mold in that respect. This comic takes EVER dog and cat pun or joke out there and parades it around like it’s a lab with a big stick and NONE of them work. I would give you guys some examples but I can’t bring myself to type them out. Pacing wise it is very competent. It sets up the premise, it establishes the characters, it gives us some highs, it shows our heroes at their worst, then gives us a clever little climax. It’s basically “the brave little corgi that could” but with giant mecha… and that’s kind cool. So this is a hard one. The premise is insane and fun, the art is good, the lettering is on point, the pacing and premise were well done, but the dialogue is painfully bad. Ultimately… I’d say give it a read. Just kind of accept the terrible puns and (for the most part just ignore the dialogue actually) and it’s a damn good comic. PS: The corgi sitting with his head on my lap for the majority of this review in no way influenced my review of this comic. Visually competent and only misses the mark by a bit. So today I’m reviewing a style of comic I don’t normally review. 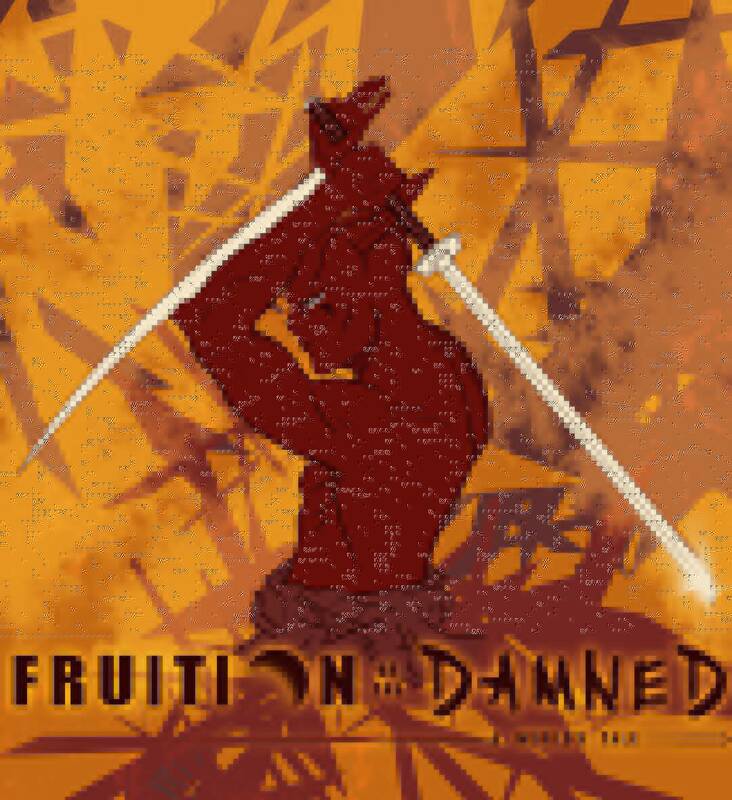 I’m taking at look at Fruition of the Damned- an online scroll comic. You can check it out here and kinda read along with me. As always, I am reading the first “issue” (called “Book 1”) and won’t be touching on stuff post that. Let’s talk layout first. Being a new layout for a comic reviewed on this site, I should clarify what it is. It’s essentially a long image (or series of images) that kind of scroll down an overlong page. It’s used pretty effectively here and, I’ve read a few others, this one kind of stands out as one of the better laid out ones. They kind of work best for mobile readers, but the long load time due to loading a lot of image data always kind of killed it for me on my phone. I read it on my PC for that reason and the one thing that kind of bothers me is that the panels / individual images don’t have their edges line up perfectly. Some have a white background / trim /stroke while others have no background (transparent) or black. Even then, while it DOES do some cool things with it- I could still see this working as a normal comic so I won’t knock it for using this layout format and, while cool, it won’t be getting any major bonus points from me. One thing I do like about this is the visual world building aspects of it. We have weird birds, very original races, technology, some cool fauna, and the like. All and all it creates a very cohesive world- which is a nice touch for this comic. Honestly, this comic would have got a much lower rating if it were not for the cohesive and original art direction. One thing that doesn’t do this comic any favors is the sheer space (I’d say pages but… you know) dedicated to fight scenes. They are fun and the scroll format is well utilized but I can’t help but feel like I’m watching filler in an anime rather than the meaty plot stuff. It DOES offer some rather aesthetically pleasing scenes and well laid out panels but comics straddle this line. They are a visual medium but, as they are a sequential style of art dedicated to conveying a story- I can’t help but feel like they focused too much on the visuals and really didn’t dedicate enough space to story. You are probably about 40-60% of the way though book 1 before you start really getting to any story elements. Now, almost at odds with that previous statement I WILL say that this comic does a great job doing visual storytelling (particularly later). This is when dialogue is either absent or superfluous to the visuals as they are conveying the story (though setting, character, and expression). So let’s talk more technically art a bit here. It’s a very unique comic. I don’t know if this is the most polished or technically competent art that I’ve ever seen. However it is a very unique style and you quickly get use to any little quirk or issue for the sheer ambition of the style. There are some very unique almost one-point perspective panels and the use of monochromatics on a few panels are very effective (especially when they are used to convey a specific emotion). The technical issues I mentioned really come from some of the character drawings. Like there are little issues with proportions due to perspective and oversimplifications of characters in certain renderings. Again, it’s not a BIG concern but it doesn’t blow me away either. His backgrounds however are STUNNING. Just beautiful. The artist also has a very nice use of dynamic posing and can convey motion (even some of the more exotic moves) very well, knowing just where to break panels so that we still see the sequence without breaking the pacing and flow. So I guess the best description for this comic’s art is, “Ambitious, stylistic, imaginative, energetic, but not technically perfect”. Seriously though- give this guy like 5 years more and he’ll be drawing your next favorite series. So, as I mentioned before this is a very competently established aesthetic. I love some of the character designs- even minor characters like background combatants have a very distinctive look to them that fits in with the overall artistic narrative. It definitely takes some Gendi Tartakovsky or Michael Dante DiMartino (Avatar) influence on their stuff and I couldn’t help but thinking that the Elf King could have been designed by like Ayami Kojima or something. Plot wise, I am going to keep this kind of brief. I’m not interested in giving spoilers, but it’s pretty easy to see things coming. It’s a story of family, has some fairly stock characters, and has some war/combat elements to it. I am not going to judge it too harshly- it tells the story it wants to tell and does so competently. I have a feeling that this is pulling a bit of a Joss Whedon thing with the characters- the first bit of the narrative establishes the status quo and the remainder of the story is dedicated to their growth from that established narrative. The end hints at that. I won’t say this comic tries to tell a complex tale, it’s no Game of Thrones, but it’s a well told story. Overall, I have to ask myself “would I want to read the next one” and… honestly I think I would. It tells a tale I want to get into and it does so with broad, effective, compelling strokes. It’s got some good world building and I kind of want to see where it goes. It’s a pretty simple story but it’s got potential.